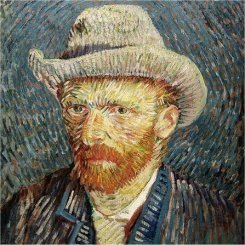 Vincent van Gogh is one of the most famous painter of all times. He lived in the nineteenth century, and his work can be categorized in the post-impressionism of that age. 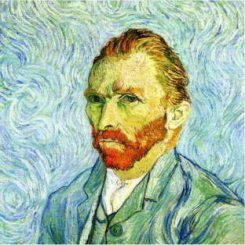 In an attempt to gather some of the best paintings by Vincent van Gogh (1853-1890) we have selected seven of the most well-known masterpieces of the Dutch artist. While most of them were consecrated by art critics and the public, others were singled out by the Dutch painter himself who considered them his most accomplished works. Visit the van Gogh Museum to see most of these paintings in real life. Skip the line and get your tickets here! Wishing to emulate two of the painters whose work he admired, Dutch painter Jozef Israëls and Jean-François Millet, in 1885 Van Gogh gives us his take on the peasant theme. In a letter to his brother Theo Vincent confides: "I wanted to convey the idea that the people eating potatoes by the light of an oil lamp used the same hands with which they take food from the plate to work the land" and that "they have earned their food by honest means". Van Gogh worked on the painting while in Nuenen, the Netherlands. 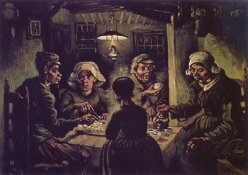 After his previous works had been received with reservations by Theo, Vincent is confident: "I think that the pictures of the peasants eating potatoes that I painted in Nuenen is the best of all my work." Van Gogh painted The Bedroom while in Arles, France. Certainly one of the most well-known paintings by Vincent Van Gogh, it depicts the interior of his bedroom in the Yellow House. Some of the most striking features of the painting are the bright and contrasting colors and the somewhat unusual perspective. The choice of colors was not arbitrary - instead it was meant to convey a state of domestic comfort and stability. In Vincent's own words: "Color must be abundant in this part, its simplification adding a rank of grandee to the style applied to the objects, getting to suggest a certain rest or dream ". 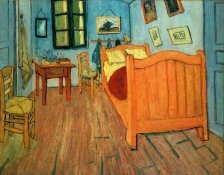 Van Gogh painted three versions of The Bedroom. 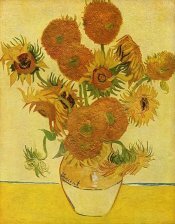 The Sunflowers paintings are undoubtedly some of the most famous paintings by Van Gogh. He painted the series of still lifes (four paintings) in Arles in August 1889 as a preparation for the visit of his painter friend Gauguin. Finally only two will be considered worthy to decorate the room of his friend who had expressed appreciation for an earlier painting by Van Gogh depicting sunflowers, namely Sunflowers Run to Seed. Van Gogh worked frantically on the series of sunflower themed paintings as he was eager to paint them before they wilted. From a letter to Theo: "I am working with the enthusiasm of a man from Marseilles eating bouillabaisse, which shouldn't come as a surprise to you because I am busy painting huge sunflowers." Wheatfield with crows is one of the last paintings by Vincent van Gogh. As it was painted in July 1890 in Auvers-sur-Oise it was claimed to be the very last canvas he executed. Additionally, the tempestuous skies and the cut-off pathway have been hinted at as premonitory symbols of his approaching end. All that can be proved though is Van Gogh's intention to convey via his wheatfield landscapes feelings like grief and sorrow. In a letter sent from Auvers he writes to his brother Theo: "They depict vast, distended wheatfields under angry skies, and I deliberately tried to express sadness and extreme loneliness in them." While in the asylum at Saint-Remy, France, Van Gogh overcame a period of crisis (ending in April 1890). 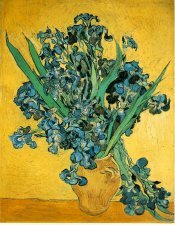 After this, Van Gogh painted two still lifes for which he used as a model irises he picked up from the nearby fields. Set against a complementary yellow background, the purple irises create an unusual effect. In van Gogh's words, he uses "enormously divergent complementary colors that are exalted by their oppositions". The other 'Irises' painting by Van Gogh is in the J. Paul Getty Museum in Los Angeles (and is among the most expensively sold paintings by Vincent van Gogh). Almond Blossom too dates from the period Van Gogh spent in Saint-Remy. Upon hearing the news of the birth of his nephew, his brother's son, Vincent painted this canvas of blossoming almond branches set against of a turquoise background. 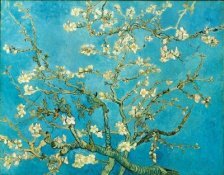 Along with being on of the favourite subjects of his younger brother, the almond branches were a symbol of Vincent newly-found tranquility. The painting was a gift from Vincent for his brother Theo and was meant to be hanged above the couple's bed. The technique used in this particular canvas has been influenced by the Japanese prints Van Gogh had seen while in Antwerp and Paris. 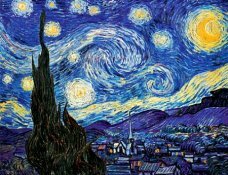 Starry Night is perhaps the most reproduced of all paintings by Vincent van Gogh. It was painted while Vincent was staying at an asylum in Saint-Remy, France. The bright stars and moon set against a background of swirling clouds create a unique visual appeal and exude a mood to which many of us can relate. It has been speculated that the eleven stars that can be distinguished in the painting are a reminder of Vincent van Gogh's past as a young man who dreamt of becoming a pastor. This selection contains only a few of the many paintings by Vincent van Gogh that have become instantly recognizable to art lovers around the world. However, despite not being able to sell many paintings during his lifetime, Vincent van Gogh a very prolific artist. The largest collection of works by Vincent van Gogh can be visited at the Van Gogh Museum in Amsterdam. With 1.5 million visitors a year, the Van Gogh Museum is Amsterdam's best visited museum - even before the Rijksmuseum and the Anne Frank House. Nowhere you'll find more of Vincent van Gogh's paintings (around 200) and also his drawings and letters. It also has a lot of art by his contemporaries - impressionsts, post-impressionists and other artists like Gauguin, Monet, Rodin, Denis etc. Additionally, it regularly runs exhibitions on 19th-century topics. 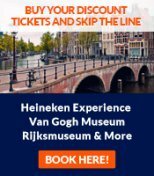 Skip the line and buy your tickets for the van Gogh Museum here.